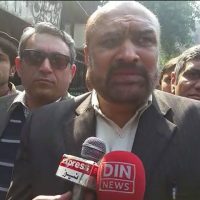 A duty magistrate in Lahore on Sunday granted bail to Din News TV host Rizwanur Rehman Razi ‘Dada’, who was arrested a day earlier for allegedly uploading “defamatory and obnoxious” posts against the judiciary, government institutions and intelligence agencies on his Twitter account. The Federal Investigation Agency’s (FIA) cybercrime cell had on Saturday arrested Razi from his residence in Jauhar Town, confiscated his mobile phone and booked him under Sections 11 and 20 of the Prevention of Electronic Crimes Act (Peca), 2016, and 123-A and 500 of the Pakistan Penal Code. During the hearing, Razi’s lawyer said there was no reason to grant the FIA physical remand of his client as the constitution allows for the expression of opinions. He said the journalist had expressed his personal opinion which could not be called a crime. “Can positive criticism be called a crime?” the lawyer asked, adding that his client was a teacher and a journalist and yet he was presented in court in handcuffs. While rejecting the FIA’s request for remand, the judge ordered Razi to avoid making comments about the judiciary. He said that this was a “test case” for the journalist and that the “system” should be carried forward. In the First Information Report (FIR), the agency had stated that the TV host “admitted” to uploading content against the judiciary and other departments, and was “very embarrassed” and had even apologised. Razi, as per the FIR, promised that he would “not upload such derogatory/humiliating posts” against state institutions such as the judiciary, Pakistan armed forces and intelligence agencies. The FIA said that Razi’s mobile phone was confiscated during the inquiry and a forensic data extraction report was obtained. Furthermore, the agency said it has “accorded permission to register a case” against Razi. The FIR against Razi mentioned Sections 11 and 20 of the Peca 2016 — a cyber-crime law which had been widely criticised by civil rights campaigners as ‘draconian’ at the time of its passage by the Nawaz Sharif-led PML-N government. Section 20, meanwhile, pertains to “offences against the dignity of a natural person” and carries “imprisonment for a term which may extend to three years” or a fine which may extend to Rs1 million. The FIR also lists Section 500 of the PPC, which pertains to defamation and carries “an imprisonment for a term which may extend to two years” or a fine, or both.